Principal, means the main element, the senior most person in an organization. On the contrary, Principle implies the primary belief of fundamental importance that governs the life of an individual or acts as a rule on which something operates. There are many words in English that not only look alike but also sound alike and one such pair of words is ‘Principal and Principle’. Nevertheless, these two words are not similar in their meaning, but as they are homonyms, people commonly use them interchangeably which is wrong. Now let’s have a look at the given examples, which will help you in understanding the difference between principal and principle. Our school Principal believes on the principle of equity. My principal aim in life is to follow my principles. 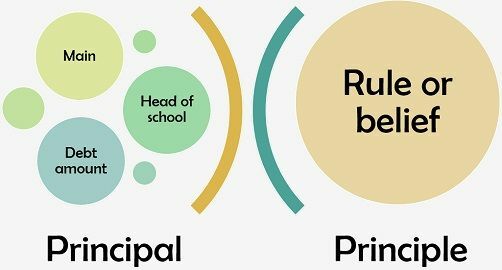 In the first example, by the term ‘Principal’ we are referring to the school in charge, while ‘principle’ implies rule. In the next one, the ‘principal’ refers to the primary while ‘principle’ refers to dogma. Meaning Principal denotes the most important thing or it also refers to the head of a school or college. Principle refers to the truth, belief or proposition, that acts as a basis of a system or behavior. Specialized meaning It has specialized meaning in the field of finance and law. No such specialized meaning. Examples Our school principal is very strict. The basic principle of the business is to make profit. The principal element of friendship is trust. Indian law is based on the principle that every person is same in the eyes of law. Arun will return the principal and interest, by the end of this year. Scientific principles are universal in nature. China is the principal rice producing country in the world. ‘Don’t shout’, said the Principal. The class teacher has discussed the problem with the Principal. In the field of finance, it refers to the original amount lent or borrowed to/from someone, which requires repayment. Miss Lee has lent Rs. 1 lakh to Jenny, as Principal, @ 10% interest. In law, a person who designates another person as as an agent to act on his behalf. The principal consigns goods to the agent for selling purposes. She has some principles and that’s the reason for her refusing the proposal. My principle in life is to help the needy ones. DC motor works on the principle of Lorentz Law. Henry Fayol introduced 14 principles of management. Principal implies the most important thing, it also refers to a person of high authority in a school or college. On the other hand, the principle means canon, it refers to a moral belief, about what is good or bad, right or wrong, which regulates the behaviour of a person or how something works. The term principal has a specialised meaning in finance, i.e. it implies the original sum lent or borrowed to/from a person/bank on which interest is charged/earned. Further, in law, it refers to a person who delegates another person to act as his/her agent. In contrast, the word principle has no other meaning in these fields. The principal can be used as a noun or an adjective. Conversely, the word principle is a noun. Example: I ignored what my parents said and that was my principal mistake. I have certain principles, which I can’t ignore. I got an award from the Principal for winning first prize in Inter-school essay writing competition. The bank was able to recover only 20% of the Principal from the borrower. The principal reason for the failure of this project was negligence. The principle of reinforcement is the basis for carrot and stick approach. Vinay does not take a bribe, as it is against his principles. People nowadays have no principles and values. You can remember the difference between principal and principle by recalling their meanings with the last two letters. While you can connect principAL with substantiAL, materiAL or cruciAL whereas principLE can be associated with ruLE.